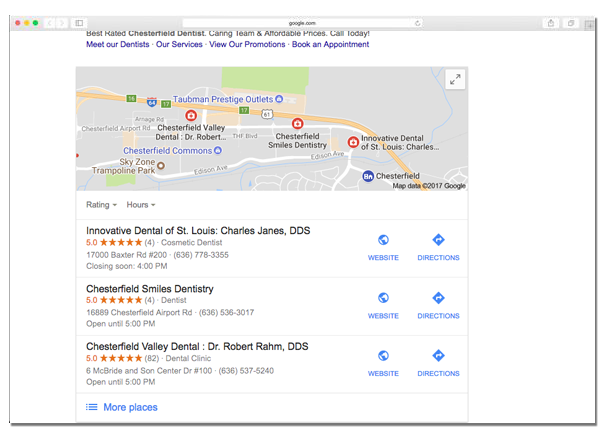 Optimizing your local search listings helps bring new customers directly to your business. Ensure your business location(s) is correctly listed not only on your website, but other local listing sites such as Google, Bing, Yelp, YP.com, etc. Keep tabs on reviews and comments (and respond to them as well). Move your business up the ranks (i.e. if you own a local Mexican restaurant, you want it to come up on the first page of Yelp). WHY WORRY ABOUT LOCAL SEARCH MARKETING? You already have a company website with excellent UX design (good for you!) but that’s not the only place people are finding you. If someone is specifically searching for a Mexican restaurant in Chesterfield, MO, your business better show up! Even more, sites where customers provide reviews or comments (such as Yelp or Facebook) need to be monitored and handled. You need to be aware of what people out there are saying about you. With that in mind, there are so many different types of sites where your business information can appear. If you have different locations, phone numbers, and business hours listed all over the place, customers can find this very discouraging. When you have a business to run, it can be difficult to find the time to keep tabs on all the happenings in the digital world. That’s why we’ll use our experience to deal with the challenges and obstacles you may face. Let us help you make your online business more successful. We are your St. Louis local search marketing advisors, and we are ready to work with you! Call or email us today for a free consultation.